Microsoft will soon strip the preview label off its Office for Windows 10 apps -- Excel, PowerPoint and Word -- and require an Office 365 subscription to use them on PCs, 2-in-1s and larger tablets running the new OS. Gabriel Aul, engineering general manager for Microsoft's OS group and the mouthpiece for Windows 10, today outlined the final days of work on the touch-centric apps in a blog where he also announced another Windows 10 build for Insiders participants. "There are a few changes to the apps coming up that are part of helping them get ready for their release with Windows 10," Aul wrote. "We will also remove 'Preview' from the app names and in about one week, you will need an Office 365 subscription to edit on Windows 10 PCs and larger tablets." 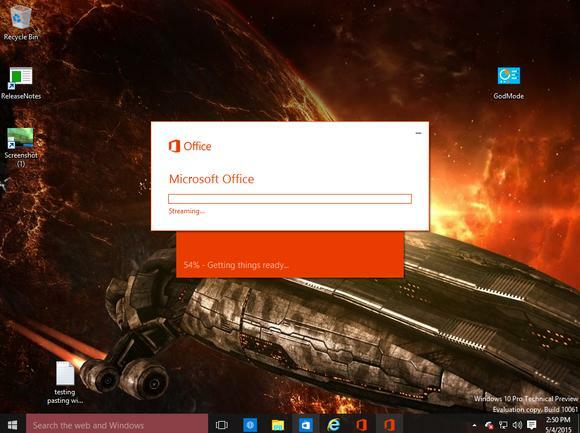 Earlier today, several blogs and media outlets had called Office for Windows 10 done. Apparently, that's not the case. As Aul noted, Microsoft continued to mark the apps as "Preview" in the Windows 10 Store, Microsoft's official distribution mart for both classic and new-form Windows applications and apps. The latest versions, however, were not tagged with a preview label once they had been downloaded to a Windows 10 device running build 10166. Instead, the new moniker of "Mobile" has been added to the apps' names, as in Word Mobile, Excel Mobile and PowerPoint Mobile. Aul said that the new names were to distinguish them from the same-named applications in the desktop suites for Windows and OS X. Previously, Microsoft had said that it would ship Office for Windows 10 alongside the operating system itself. Windows 10 is slated to launch on July 29, with Insider testers getting first dibs and others having to wait until Microsoft authorizes their Windows 7 and Windows 8.1 PCs to start an upgrade. The simultaneous debuts are still the plan, another Microsoft spokesperson said in an email. Microsoft issued previews of the touch-centric Excel, PowerPoint and Word more than five months ago. But in Microsoft's new world order, nothing is ever really finished. So while the Preview label has disappeared from Excel, PowerPoint and Word, they will continue to be modified, enhanced and monkeyed with, both before July 29 and after. The licensing terms for Office for Windows 10 have also been updated -- providing more clarity on how Microsoft will distribute the apps, and more importantly, make money from them -- but it was Aul who set the record straight. In February, Microsoft declined to detail how it would handle Office for Windows 10 apps on PCs, 2-in-1s and tablets with larger screens -- Computerworld called that collection Office Large to differentiate it from the same-named apps for Windows smartphones and small-screen tablets, pegged as "Office Small" -- saying then, "We are trying out a few different scenarios and will share more licensing and pricing details at general availability." Computerworld asked Microsoft to flesh out the apps' licensing today, but instead Aul stepped in. "Similar to what we announced in March, viewing and most editing will remain free for non-commercial use on devices of 10.1-in. or less," Aul said. "Otherwise, you will need a qualifying Office 365 subscription." Aul pointed users toward the free Office Online browser-based apps as an alternative for those who do not have, and do not care to have, a rent-not-own subscription to Office 365. The just-revised license agreement explained some of what Aul said. Anyone who wants to use the apps for business purposes -- for work tasks, in other words -- must abide by the must-have-Office 365 rule. "Word, Excel, PowerPoint and OneNote are licensed for your personal, non-commercial use, unless you have commercial use rights under a separate agreement [emphasis added]." Microsoft did not elaborate on what that "separate agreement" might be, but Aul's warning that an Office 365 subscription would be required was backed up by the apps themselves. In the apps' Settings pane, under "About," the tag "License Information" showed a linked Office 365 account when that account "owns" an Office 365 subscription. The Redmond, Wash. company also signaled that the Office for Windows 10 apps will be widely bundled with new Windows 10 devices. "If you acquired the software preinstalled on your device, the Microsoft Software License Terms you agreed to for Windows Operating System ('Windows OS License Terms') apply to your use of the Office Mobile Apps software," the license agreement read. Thus Office for Windows 10 will be licensed differently than other mobile versions of the suite, including the apps for Apple's iPhone and iPad, and for smartphones and tablets powered by Google's Android. Microsoft has treated Office on mobile platforms -- including touch on Windows 10 -- as an adjunct to the desktop suite, and so has been freeing some functionality. That means core features, like creating, editing, viewing, saving and printing documents are free for consumers. Some advanced features are blocked, and unlocked only if the user has a subscription to Office 365 Home or Office 365 Personal. For Office for Windows 10 on PCs, hybrids -- like Microsoft's own Surface Pro 3 -- and tablets with screens 10.1-in. or larger measured diagonally, users will need an Office 365 subscription, either consumer- or commercial-grade, for all activities, even the core create-edit-save given away on Office for iPad and the Office Small app set. Business customers must have a subscription such as Office 365 Business ($8.25 per user per month), Office 365 Business Premium ($12.50) or Office 365 Enterprise E3 ($20), to use the apps for work chores, whether Office Large or Office Small. The bottom line: Microsoft went in the third direction Computerworld listed as a possibility in February. "The most expedient solution would be to tie Office Large to Office 365," Computerworld speculated then. "In that case, it would probably count Office Large as one of the five allowed PC or Mac installs for each user, not as one of the five smartphone or five tablet installs." But Computerworld got that last bit wrong. The Office for Windows 10 licensing agreement stated, "Word, Excel, PowerPoint and OneNote are licensed for your personal, non-commercial use. Under this agreement we grant you the right to install and run one instance on up to each of ten (10) of your Windows 10 devices (the licensed devices) that are affiliated with the Microsoft account associated with your Windows Store account." So Office for Windows 10 doesn't count against either the PC or the mobile device install allowances, but against the 10 total for each user. If a user has already maxed out the five-installs allotment for personal computers, they could still install Office for Windows 10 on, say, a sixth PC running the new OS. The latest Excel, PowerPoint and Word touch-enabled apps can be downloaded from Microsoft's online Store within Windows 10. 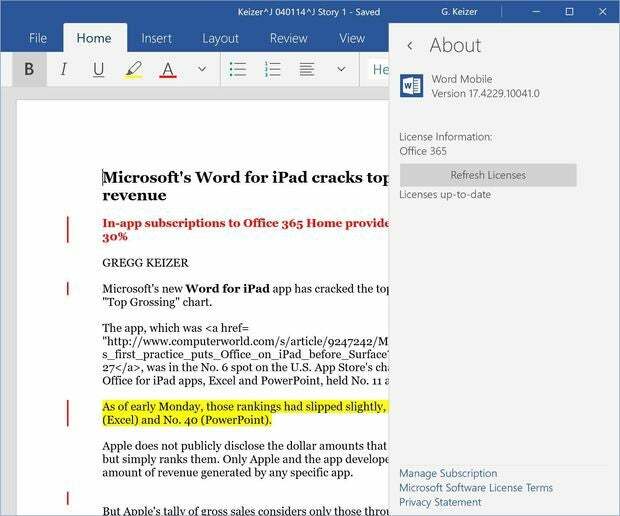 The almost-finished Office for Windows 10, including Word Mobile (shown here), will require a link to an active Office 365 subscription to unlock even core features and/or make work chores legal on the touch-oriented apps.